This quick quiche recipe uses bread instead of pastry for the shells! Use rolling pin to flatten each bread slice to 5-inch square. Cut out centres with 3-1/2-inch round cookie cutter. Discard trimmings or reserve for another use. Press 1 bread circle onto bottom and up side of each of 12 muffin cups sprayed with cooking spray. Bake 8 to 10 min. or until golden brown. Reduce oven temperature to 350ºF. Meanwhile, whisk 1 egg and cream cheese product in medium bowl until blended. Add remaining eggs, milk, ham and onions; mix well. Pour into bread shells. Bake 18 to 20 min. or until filling in centre of each cup is set. Serve warm. Use food processor or blender to make bread crumbs out of the bread trimmings. Store in small freezer-weight resealable plastic bags in freezer for later use in your favourite recipes. 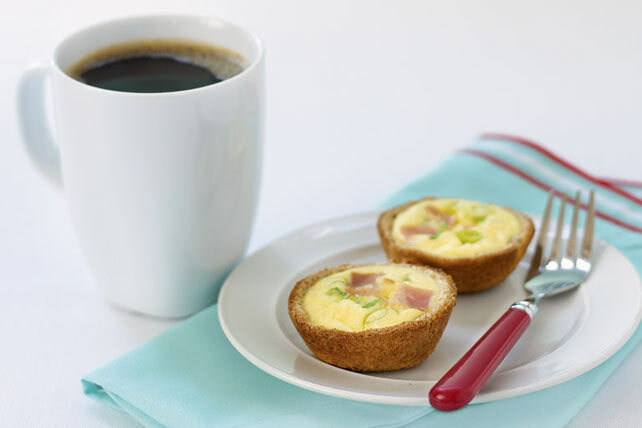 These easy-to-make quiche, made with better for you products, can be part of a healthful eating plan.